Hockey Book Reviews.com: Concussed! Sports Related Head Injuries: Prevention, Coping and Real Stories. Concussed! Sports Related Head Injuries: Prevention, Coping and Real Stories. NHL stars don't get much bigger than Keith Primeau. The 6'5" and 220lb behemoth was a mountain of a player, driving hard through the defense, imposing his hulking physical advantage at will. The former NHL all star was a rare combination of size and skill. He was seemingly unstoppable. Except he was. And the resulting damage is scary. Primeau suffered 4 documented concussions. Like so many NHL heroes, he kept rushing back to return to the ice, unaware of the long term brain damage he was inflicting upon himself. By the 4th concussion suffered early in the 2005-06 season he was unable to come back. A year later he retired. Hockey's giant was slain by hockey's giant problem - concussions. Now Primeau is determined to make sure this giant problem is no longer swept under the rug. The 15 year NHLer wants to make sure no player - be it in the NHL or the local recreational league - rushes back from a head injury. He has made it his purpose in life to educate players, coaches and parents about the dangers of concussions. The book offers great advice on how to cope with sports-related head injuries in children and youth, with tips on symptoms to look for, what to do when you suspect a concussion, guidelines for return to play and the possible long-term effects. Primeau - who still suffers symptoms all these years later - is very open about his scary story, telling readers his disturbing truth of living with a concussion. Other true stories of athletes and families who are living daily with the effects of being concussed are also discussed. Concussions are plaguing professional sports - and hockey in particular - and it has seeped down to amateur and youth levels. The damage and impact is scary and significant. Yet every concussion is different, and no one really knows what it is like outside of the victim. There is so much ignorance out there concerning concussions. 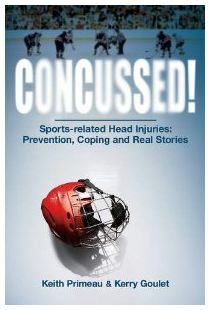 Thanks to Primeau and Goulet and friends, the new book Concussed! hopefully can go a long ways to educating athletes, coaches and parents about concussions. That makes this book one of the most important texts of the hockey book market of 2012. Former Toronto Maple Leafs standout Ron Ellis provides the book's foreword. Goulet did much of the writing himself, with the instrumental guidance of noted author Kevin Shea. A large part of the book was edited and ghost-written by Monika Moravan, an up and coming writer on the hockey scene. She did an excellent job of keeping the text engaging for older readers, yet not-intimidating for younger readers. Changing the culture of sports injuries specifically concerning the head must hit home at the youth level. It is essential that they know playing through a concussion should not be an accepted practice. Brain damage is not worth the personal or societal pressures to return to the game as soon as possible. Sadly this is the type of book many hockey fans will overlook when looking at all the new hockey books on store shelves in 2012. But if you are a player, or if you have a child who plays, you should really take the time to better educate yourself on possibly the biggest injury concern hockey has ever faced. Well done, Joe. With the NHL game out of commission, that precious free time we found difficult to secure is now unlocked. No better time to read this book.